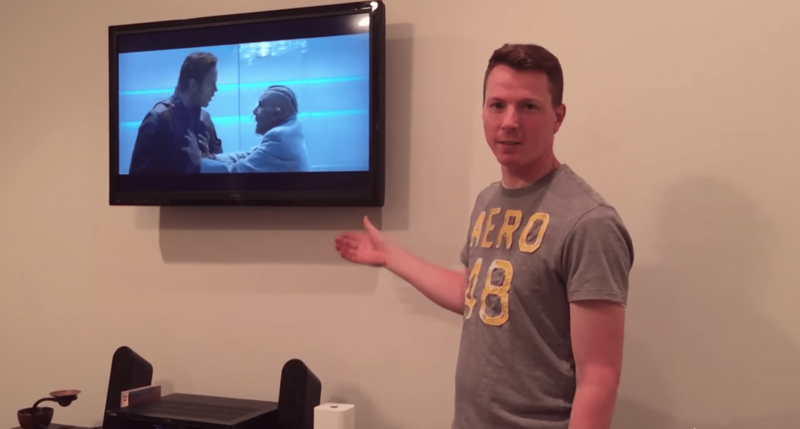 Mounting your TV to your wall makes it look great, frees up space and gives you a great view. The wires that hang down, however, look pretty ghetto. 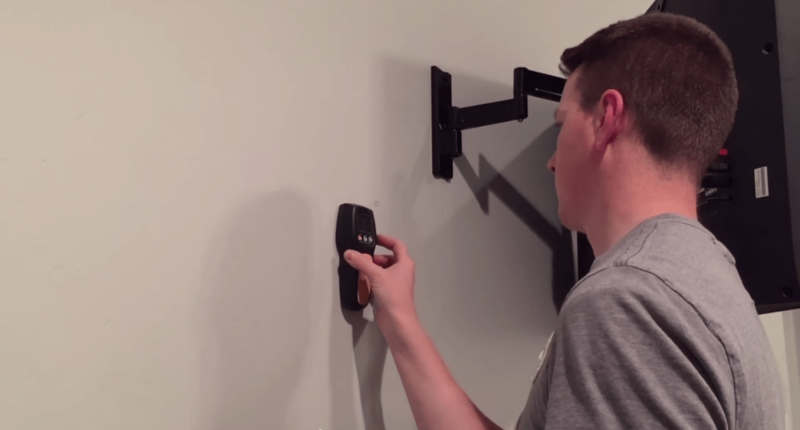 Here’s an explanation of how to hide those wires in the walls for only $10. Caveat 1: This installation assumes you have mostly hollow walls behind and underneath your television. If you’re mounting the TV on an exterior wall, a wall with a fire block, a brick wall or other types of walls that present challenges, extra work will be required. Caveat 2: In many areas, local code requires that high voltage wiring be installed, not fished through the wall. A separate electrical outlet should be installed behind the TV. 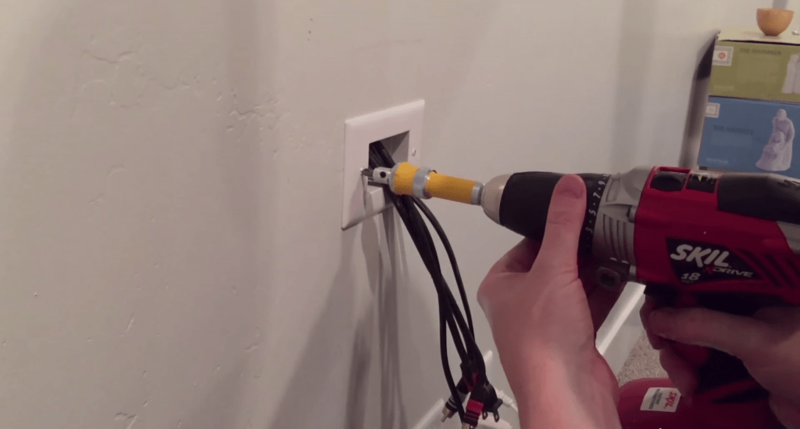 To learn how to do this, see my video on adding an electrical outlet for your wall mounted TV. Step 1: Behind your TV, mark the general area where you’d like the cables to come out of/go into the wall and then the lower location of the receiving receptacle. Keep in mind that the top receptacle should be (if possible) directly above where you’ll be putting the lower receptacle. The lower receptacle should be behind your entertainment center or a/v equipment. Step 2: Using the stud finder, check for interferences that may cause difficulty. The easiest method is to place both plates where there are no studs or fire blocks between them. Step 3: Use the provided template for the receptacles and draw out the two cuts that you’ll be making. Step 4: Cut out the holes using the utility knife or jab saw. Step 5: Place the upper receptacle in the hole and screw it in the wall so that the tabs flip out and grab the drywall. Make sure they’re on there snug but don’t over tighten. Once in place, feed all appropriate wires from the top down to the lower hole and pull them through the hole. Step 6: Feed lower wires through the receptacle, then install lower receptacle in the wall as above. Connect your wires on top and bottom and you’re good to go! Ready to see the whole thing in action? Check out my video to watch the whole process. If you have any questions, just leave a comment below. Here are the suggested products from Amazon for this project. 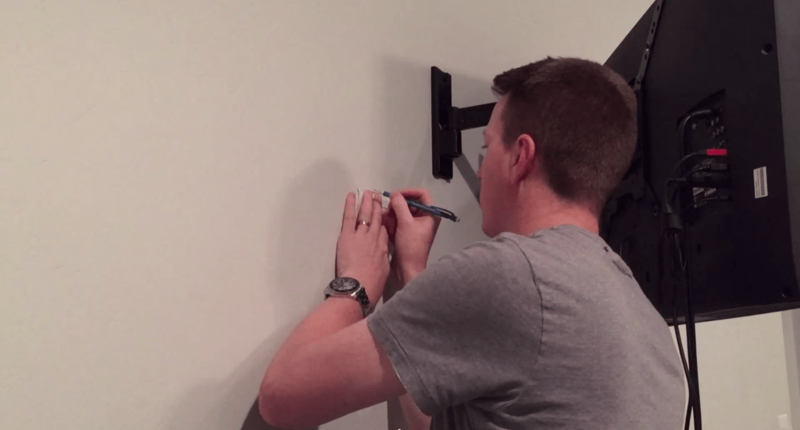 Have you considered doing a DIY for an extended flip out TV mount with AIO frame? Surely it HAS to be much cheaper to make than to purchase! I would really like one for the bedrooms, but at $899 a pop I don’t see that happening. Please tell me you have that in the works???? Your instructions and videos are so easy to follow, I feel my husband and I could make one following YOUR instructions and tutorials! PLEASE! I really haven’t considered it but I’ve seen them before and they are pretty awesome. I would probably want to weld something like that to make it extra secure. My wife has a fear of the ceiling fan flying off and killing her so I can imagine how she’d feel about having a TV hanging above her with some wooden arms, ya know? 🙂 I’ll give it some thought but I think it’d be a pretty complex job for us DIYers.